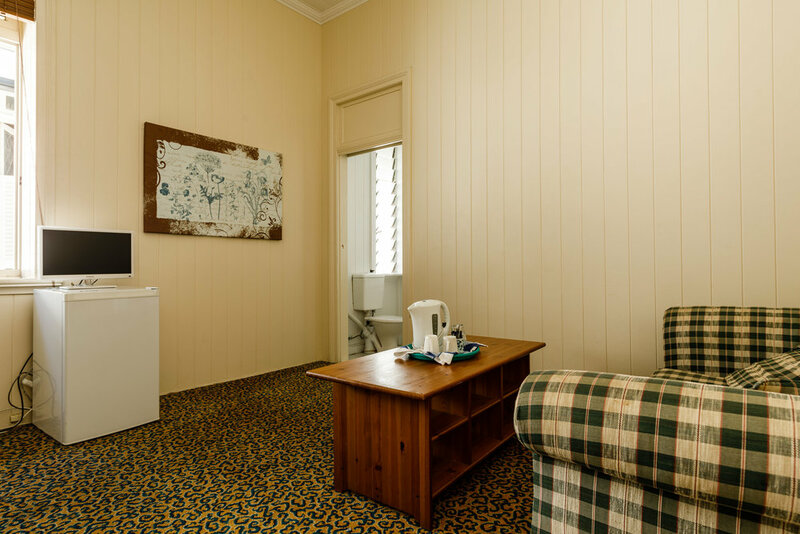 Bowen Terrace Accommodation offers both private guest house rooms upstairs and hostel dorm rooms downstairs. This page is to show the unique rooms. It shows specific room numbers which are slightly different to the standard rooms offered under that room type. For example, while we sell the room below as a Queen Room, it can also be configured as a Family Room as an alternative option. This room is normally sold as a Queen Room, meaning if you book a Queen Room you might get this automatically. However, if you specifically want this room to take advantage of the extra sofa bedding, it can be sold as a Family Room and linen provided for the sofa bed. Room 7 is unique because of the French Doors which provide direct access to the upstairs guest deck. This room is sold as a Queen room, and you may get this room automatically, or it can be requested if available at no extra cost. This room is also unique because of the pin code lock on the door and the larger TV.